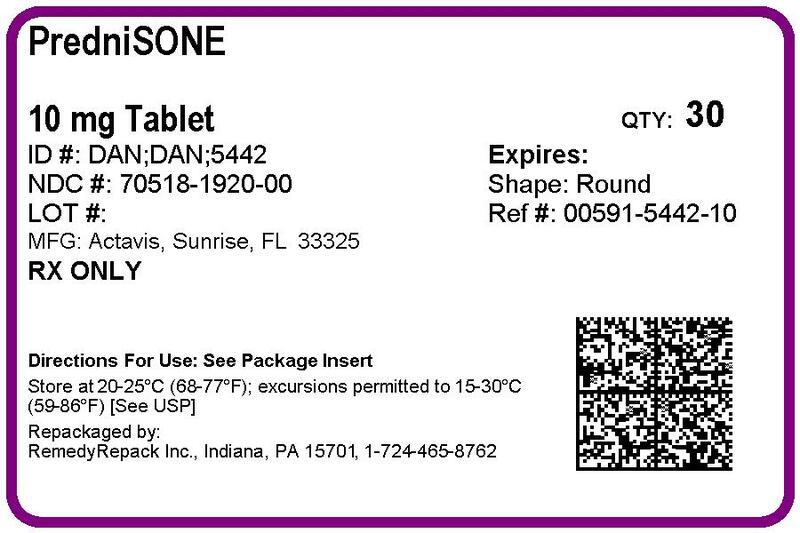 Prednisone with NDC 70518-1920 is a a human prescription drug product labeled by Remedyrepack Inc.. The generic name of Prednisone is prednisone. The product's dosage form is tablet and is administered via oral form. FDA Application Number: ANDA085162 What is the FDA Application Number? Prednisone is a white to practically white, odorless, crystalline powder. It is very slightly soluble in water; slightly soluble in alcohol, chloroform, dioxane, and methanol.Each tablet, for oral administration, contains 5 mg, 10 mg or 20 mg of prednisone, USP (anhydrous). In addition, each tablet contains the following inactive ingredients: anhydrous lactose, colloidal silicon dioxide, crospovidone, docusate sodium, magnesium stearate and sodium benzoate.Prednisone tablets, USP 20 mg also contain FD&C Yellow No. 6. Prednisone tablets, USP are indicated in the following conditions:Endocrine DisordersPrimary or secondary adrenocortical insufficiency (hydrocortisone or cortisone is the first choice; synthetic analogs may be used in conjunction with mineralocorticoids where applicable; in infancy mineralocorticoid supplementation is of particular importance); congenital adrenal hyperplasia; hypercalcemia associated with cancer; nonsuppurative thyroiditis.Rheumatic DisordersAs adjunctive therapy for short-term administration (to tide the patient over an acute episode or exacerbation) in: psoriatic arthritis, rheumatoid arthritis, including juvenile rheumatoid arthritis (selected cases may require low-dose maintenance therapy), ankylosing spondylitis, acute and subacute bursitis, acute nonspecific tenosynovitis, acute gouty arthritis, post-traumatic osteoarthritis, synovitis of osteoarthritis, epicondylitis.Collagen DiseasesDuring an exacerbation or as maintenance therapy in selected cases of: systemic lupus erythematosus, systemic dermatomyositis (polymyositis), acute rheumatic carditis.Dermatologic DiseasesPemphigus; bullous dermatitis herpetiformis; severe erythema multiforme (Stevens-Johnson syndrome); exfoliative dermatitis; mycosis fungoides; severe psoriasis; severe seborrheic dermatitis.Allergic StatesControl of severe or incapacitating allergic conditions intractable to adequate trials of conventional treatment: seasonal or perennial allergic rhinitis; bronchial asthma; contact dermatitis; atopic dermatitis; serum sickness; drug hypersensitivity reactions.Ophthalmic Diseases Severe acute and chronic allergic and inflammatory processes involving the eye and its adnexa such as: allergic corneal marginal ulcers, herpes zoster ophthalmicus, anterior segment inflammation, diffuse posterior uveitis and choroiditis, sympathetic ophthalmia, allergic conjunctivitis, keratitis, chorioretinitis, optic neuritis, iritis and iridocyclitis.Respiratory Diseases Symptomatic sarcoidosis; Loeffler’s syndrome not manageable by other means; berylliosis; fulminating or disseminated pulmonary tuberculosis when used concurrently with appropriate antituberculous chemotherapy; aspiration pneumonitis.Hematologic Disorders Idiopathic thrombocytopenic purpura in adults; secondary thrombocytopenia in adults; acquired (autoimmune) hemolytic anemia; erythroblastopenia (RBC anemia); congenital (erythroid) hypoplastic anemia.Neoplastic Diseases For palliative management of: leukemias and lymphomas in adults, acute leukemia of childhood.Edematous States To induce a diuresis or remission of proteinuria in the nephrotic syndrome, without uremia, of the idiopathic type or that due to lupus erythematosus.Gastrointestinal Diseases To tide the patient over a critical period of the disease in: ulcerative colitis, regional enteritis.MiscellaneousTuberculous meningitis with subarachnoid block or impending block when used concurrently with appropriate antituberculous chemotherapy; trichinosis with neurologic or myocardial involvement. Average and large doses of hydrocortisone or cortisone can cause elevation of blood pressure, salt and water retention, and increased excretion of potassium. These effects are less likely to occur with the synthetic derivatives except when used in large doses. Dietary salt restriction and potassium supplementation may be necessary. All corticosteroids increase calcium excretion. Literature reports suggest an apparent association between use of corticosteroids and left ventricular free wall rupture after a recent myocardial infarction; therefore, therapy with corticosteroids should be used with great caution in these patients. Corticosteroids can produce reversible hypothalamic-pituitary adrenal (HPA) axis suppression with the potential for corticosteroid insufficiency after withdrawal of treatment. Adrenocortical insufficiency may result from too rapid withdrawal of corticosteroids and may be minimized by gradual reduction of dosage. This type of relative insufficiency may persist for up to 12 months after discontinuation of therapy; therefore, in any situation of stress occurring during that period, hormone therapy should be reinstituted. If the patient is receiving steroids already, dosage may have to be increased. Metabolic clearance of corticosteroids is decreased in hypothyroid patients and increased in hyperthyroid patients. Changes in thyroid status of the patient may necessitate adjustment in dosage. General Patients who are on corticosteroids are more susceptible to infections than are healthy individuals. There may be decreased resistance and inability to localize infection when corticosteroids are used. Infection with any pathogen (viral, bacterial, fungal, protozoan or helminthic) in any location of the body may be associated with the use of corticosteroids alone or in combination with other immunosuppressive agents that affect cellular immunity, humoral immunity, or neutrophil function. 1 These infections may be mild, but may be severe and at times fatal. With increasing doses of corticosteroids, the rate of occurrence of infectious complications increases. 2 Corticosteroids may also mask some signs of current infection. Amoeba, Candida, Cryptococcus, Mycobacterium, Nocardia, Pneumocystis, Toxoplasma. It is recommended that latent amebiasis or active amebiasis be ruled out before initiating corticosteroid therapy in any patient who has spent time in the tropics or any patient with unexplained diarrhea. Similarly, corticosteroids should be used with great care in patients with known or suspected Strongyloides (threadworm) infestation. In such patients, corticosteroid-induced immunosuppression may lead to Strongyloides hyperinfection and dissemination with widespread larval migration, often accompanied by severe enterocolitis and potentially fatal gram-negative septicemia. Corticosteroids should not be used in cerebral malaria.Tuberculosis The use of prednisone in active tuberculosis should be restricted to those cases of fulminating or disseminated tuberculosis in which the corticosteroid is used for management of the disease in conjunction with an appropriate antituberculous regimen. If corticosteroids are indicated in patients with latent tuberculosis or tuberculin reactivity, close observation is necessary as reactivation of the disease may occur. During prolonged corticosteroid therapy, these patients should receive chemoprophylaxis.Vaccination Administration of live or live, attenuated vaccines is contraindicated in patients receiving immunosuppressive doses of corticosteroids. Killed or inactivated vaccines may be administered. However, the response to such vaccines may be diminished and cannot be predicted. Indicated immunization procedures may be undertaken in patients receiving nonimmunosuppressive doses of corticosteroids as replacement therapy (e.g., for Addison’s disease). Viral Infections Chickenpox and measles can have a more serious or even fatal course in pediatric and adult patients on corticosteroids. In pediatric and adult patients who have not had these diseases, particular care should be taken to avoid exposure. How the dose, route and duration of corticosteroid administration affect the risk of developing a disseminated infection is not known. The contribution of the underlying disease and/or prior corticosteroid treatment to the risk is also not known. If exposed to chickenpox, prophylaxis with varicella zoster immune globulin (VZIG) may be indicated. If exposed to measles, prophylaxis with pooled intramuscular immunoglobulin (IG) may be indicated. (See the respective package inserts for complete VZIG and IG prescribing information.) If chickenpox develops, treatment with antiviral agents may be considered.Ophthalmic Use of corticosteroids may produce posterior subcapsular cataracts, glaucoma with possible damage to the optic nerves, and may enhance the establishment of secondary ocular infections due to bacteria, fungi or viruses. The use of oral corticosteroids is not recommended in the treatment of optic neuritis and may lead to an increase in the risk of new episodes. Corticosteroids should not be used in active ocular herpes simplex because of possible corneal perforation. An acute myopathy has been observed with the use of high doses of corticosteroids, most often occurring in patients with disorders of neuromuscular transmission (e.g., myasthenia gravis), or in patients receiving concomitant therapy with neuromuscular blocking drugs (e.g., pancuronium). This acute myopathy is generalized, may involve ocular and respiratory muscles, and may result in quadriparesis. Elevation of creatinine kinase may occur. Clinical improvement or recovery after stopping corticosteroids may require weeks to years. Psychiatric derangements may appear when corticosteroids are used, ranging from euphoria, insomnia, mood swings, personality changes, and severe depression, to frank psychotic manifestations. Also, existing emotional instability or psychotic tendencies may be aggravated by corticosteroids.Ophthalmic Intraocular pressure may become elevated in some individuals. If steroid therapy is continued for more than 6 weeks, intraocular pressure should be monitored. Patients should be warned not to discontinue the use of corticosteroids abruptly or without medical supervision. As prolonged use may cause adrenal insufficiency and make patients dependent on corticosteroids, they should advise any medical attendants that they are taking corticosteroids and they should seek medical advice at once should they develop an acute illness including fever or other signs of infection. Following prolonged therapy, withdrawal of corticosteroids may result in symptoms of the corticosteroid withdrawal syndrome including, myalgia, arthralgia, and malaise. Persons who are on corticosteroids should be warned to avoid exposure to chickenpox or measles. Patients should also be advised that if they are exposed, medical advice should be sought without delay. amphotericin B, diuretics), patients should be observed closely for development of hypokalemia. In addition, there have been cases reported in which concomitant use of amphotericin B and hydrocortisone was followed by cardiac enlargement and congestive heart failure. neostigmine, pyridostigmine) and corticosteroids may produce severe weakness in patients with myasthenia gravis. If possible, anticholinesterase agents should be withdrawn at least 24 hours before initiating corticosteroid therapy. If concomitant therapy must occur, it should take place under close supervision and the need for respiratory support should be anticipated. warfarin usually results in inhibition of response to warfarin, although there have been some conflicting reports. Therefore, coagulation indices should be monitored frequently to maintain the desired anticoagulant effect. ciprofloxacin, levofloxacin) and corticosteroids, especially in the elderly. Tendon rupture can occur during or after treatment with quinolones. indinavir, erythromycin) may increase their clearance, resulting in decreased plasma concentration. nonsteroidal anti-inflammatory agents) and corticosteroids increases the risk of gastrointestinal side effects. Aspirin should be used cautiously in conjunction with corticosteroids in hypoprothrombinemia. The clearance of salicylates may be increased with concurrent use of corticosteroids; this could lead to decreased salicylate serum levels or increase the risk of salicylate toxicity when corticosteroid is withdrawn. Teratogenic Effects Pregnancy Category CCorticosteroids have been shown to be teratogenic in many species when given in doses equivalent to the human dose. Animal studies in which corticosteroids have been given to pregnant mice, rats, and rabbits have yielded an increased incidence of cleft palate in the offspring. There are no adequate and well-controlled studies in pregnant women. 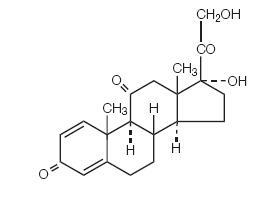 Corticosteroids should be used during pregnancy only if the potential benefit justifies the potential risk to the fetus. Infants born to mothers who have received substantial doses of corticosteroids during pregnancy should be carefully observed for signs of hypoadrenalism. ADVERSE REACTIONS). Like adults, pediatric patients should be carefully observed with frequent measurements of blood pressure, weight, height, intraocular pressure, and clinical evaluation for the presence of infection, psychosocial disturbances, thromboembolism, peptic ulcers, cataracts, and osteoporosis. Pediatric patients who are treated with corticosteroids by any route, including systemically administered corticosteroids, may experience a decrease in their growth velocity. This negative impact of corticosteroids on growth has been observed at low systemic doses and in the absence of laboratory evidence of hypothalamic-pituitary-adrenal (HPA) axis suppression (i.e., cosyntropin stimulation and basal cortisol plasma levels). Growth velocity may therefore be a more sensitive indicator of systemic corticosteroid exposure in pediatric patients than some commonly used tests of HPA axis function. The linear growth of pediatric patients treated with corticosteroids should be monitored, and the potential growth effects of prolonged treatment should be weighed against clinical benefits obtained and the availability of treatment alternatives. In order to minimize the potential growth effects of corticosteroids, pediatric patients should be titrated to the lowest effective dose. Cardio-Renal), necrotizing angiitis, pulmonary edema, syncope, tachycardia, thromboembolism, thrombophlebitis, vasculitis. PRECAUTIONS: General Precautions), lupus erythematosus-like lesions, perineal irritation, purpura, rash, striae, subcutaneous fat atrophy, suppression of reactions to skin tests, striae, telangiectasis, thin fragile skin, thinning scalp hair, urticaria. Endocrine), suppression of growth in pediatric patients. Musculoskeletal), pathologic fracture of long bones, steroid myopathy, tendon rupture (particularly of the Achilles tendon), vertebral compression fractures. Ophthalmic), optic nerve damage, papilledema. Infection), hiccups, immunosuppresion, increased or decreased motility and number of spermatozoa, malaise, insomnia, moon face, pyrexia. To report SUSPECTED ADVERSE EVENTS, contact Actavis at 1-800-272-5525 or FDA at 1-800-FDA-1088 or http://www.fda.gov/ for voluntary reporting of adverse reactions. Gastric irritation may be reduced if taken before, during, or immediately after meals or with food or milk. The maximal activity of the adrenal cortex is between 2 am and 8 am, and it is minimal between 4 pm and midnight. Exogenous corticosteroids suppress adrenocorticoid activity the least when given at the time of maximal activity (am) for single dose administration. Therefore, it is recommended that prednisone be administered in the morning prior to 9 am and when large doses are given, administration of antacids between meals to help prevent peptic ulcers. Multiple dose therapy should be evenly distributed in evenly spaced intervals throughout the day. Dietary salt restriction may be advisable in patients. Do not stop taking this medicine without first talking to your doctor. Avoid abrupt withdraw of therapy. The initial dosage of prednisone may vary from 5 mg to 60 mg per day, depending on the specific disease entity being treated. In situations of less severity lower doses will generally suffice, while in selected patients higher initial doses may be required. The initial dosage should be maintained or adjusted until a satisfactory response is noted. If after a reasonable period of time there is a lack of satisfactory clinical response, prednisone should be discontinued and the patient transferred to other appropriate therapy. IT SHOULD BE EMPHASIZED THAT DOSAGE REQUIREMENTS ARE VARIABLE AND MUST BE INDIVIDUALIZED ON THE BASIS OF THE DISEASE UNDER TREATMENT AND THE RESPONSE OF THE PATIENT. After a favorable response is noted, the proper maintenance dosage should be determined by decreasing the initial drug dosage in small increments at appropriate time intervals until the lowest dosage which will maintain an adequate clinical response is reached. It should be kept in mind that constant monitoring is needed in regard to drug dosage. Included in the situations which may make dosage adjustments necessary are changes in clinical status secondary to remissions or exacerbations in the disease process, the patient’s individual drug responsiveness, and the effect of patient exposure to stressful situations not directly related to the disease entity under treatment; in this latter situation, it may be necessary to increase the dosage of prednisone for a period of time consistent with the patient’s condition. If after long-term therapy the drug is to be stopped, it is recommended that it be withdrawn gradually rather than abruptly. Alternate day therapy is a corticosteroid dosing regimen in which twice the usual daily dose of corticoid is administered every other morning. The purpose of this mode of therapy is to provide the patient requiring long-term pharmacologic dose treatment with the beneficial effects of corticoids while minimizing certain undesirable effects, including pituitary-adrenal suppression, the cushingoid state, corticoid withdrawal symptoms, and growth suppression in children.The rationale for this treatment schedule is based on two major premises: (a) the anti-inflammatory or therapeutic effect of corticoids persists longer than their physical presence and metabolic effects and (b) administration of the corticosteroid every other morning allows for re-establishment of more nearly normal hypothalamic-pituitary-adrenal (HPA) activity on the off-steroid day.A brief review of the HPA physiology may be helpful in understanding this rationale. Acting primarily through the hypothalamus a fall in free cortisol stimulates the pituitary gland to produce increasing amounts of corticotropin (ACTH) while a rise in free cortisol inhibits ACTH secretion. Normally the HPA system is characterized by diurnal (circadian) rhythm. Serum levels of ACTH rise from a low point about 10 pm to a peak level about 6 am. Increasing levels of ACTH stimulate adrenocortical activity resulting in a rise in plasma cortisol with maximal levels occurring between 2 am and 8 am. This rise in cortisol dampens ACTH production and in turn adrenocortical activity. There is a gradual fall in plasma corticoids during the day with lowest levels occurring about midnight.The diurnal rhythm of the HPA axis is lost in Cushing’s disease, a syndrome of adrenocortical hyperfunction characterized by obesity with centripetal fat distribution, thinning of the skin with easy bruisability, muscle wasting with weakness, hypertension, latent diabetes, osteoporosis, electrolyte imbalance, etc. The same clinical findings of hyperadrenocorticism may be noted during long-term pharmacologic dose corticoid therapy administered in conventional daily divided doses. It would appear, then, that a disturbance in the diurnal cycle with maintenance of elevated corticoid values during the night may play a significant role in the development of undesirable corticoid effects. Escape from these constantly elevated plasma levels for even short periods of time may be instrumental in protecting against undesirable pharmacologic effects.During conventional pharmacologic dose corticosteroid therapy, ACTH production is inhibited with subsequent suppression of cortisol production by the adrenal cortex. Recovery time for normal HPA activity is variable depending upon the dose and duration of treatment. During this time the patient is vulnerable to any stressful situation. Although it has been shown that there is considerably less adrenal suppression following a single morning dose of prednisolone (10 mg) as opposed to a quarter of that dose administered every 6 hours, there is evidence that some suppressive effect on adrenal activity may be carried over into the following day when pharmacologic doses are used. Further, it has been shown that a single dose of certain corticosteroids will produce adrenocortical suppression for two or more days. Other corticoids, including methylprednisolone, hydrocortisone, prednisone, and prednisolone, are considered to be short acting (producing adrenocortical suppression for 11/4 to 11/2 days following a single dose) and thus are recommended for alternate day therapy.The following should be kept in mind when considering alternate day therapy:1. Basic principles and indications for corticosteroid therapy should apply. The benefits of alternate day therapy should not encourage the indiscriminate use of steroids.2. Alternate day therapy is a therapeutic technique primarily designed for patients in whom long-term pharmacologic corticoid therapy is anticipated.3. In less severe disease processes in which corticoid therapy is indicated, it may be possible to initiate treatment with alternate day therapy. More severe disease states usually will require daily divided high dose therapy for initial control of the disease process. The initial suppressive dose level should be continued until satisfactory clinical response is obtained, usually four to ten days in the case of many allergic and collagen diseases. It is important to keep the period of initial suppressive dose as brief as possible particularly when subsequent use of alternate day therapy is intended.Once control has been established, two courses are available: (a) change to alternate day therapy and then gradually reduce the amount of corticoid given every other day or (b) following control of the disease process reduce the daily dose of corticoid to the lowest effective level as rapidly as possible and then change over to an alternate day schedule. Theoretically, course (a) may be preferable.4. Because of the advantages of alternate day therapy, it may be desirable to try patients on this form of therapy who have been on daily corticoids for long periods of time (e.g., patients with rheumatoid arthritis). Since these patients may already have a suppressed HPA axis, establishing them on alternate day therapy may be difficult and not always successful. However, it is recommended that regular attempts be made to change them over. It may be helpful to triple or even quadruple the daily maintenance dose and administer this every other day rather than just doubling the daily dose if difficulty is encountered. Once the patient is again controlled, an attempt should be made to reduce this dose to a minimum.5. As indicated above, certain corticosteroids, because of their prolonged suppressive effect on adrenal activity, are not recommended for alternate day therapy (e.g., dexamethasone and betamethasone).6. The maximal activity of the adrenal cortex is between 2 am and 8 am, and it is minimal between 4 pm and midnight. Exogenous corticosteroids suppress adrenocortical activity the least, when given at the time of maximal activity (am).7. In using alternate day therapy it is important, as in all therapeutic situations to individualize and tailor the therapy to each patient. Complete control of symptoms will not be possible in all patients. An explanation of the benefits of alternate day therapy will help the patient to understand and tolerate the possible flare-up in symptoms which may occur in the latter part of the off-steroid day. Other symptomatic therapy may be added or increased at this time if needed.8. In the event of an acute flare-up of the disease process, it may be necessary to return to a full suppressive daily divided corticoid dose for control. Once control is again established alternate day therapy may be reinstituted.9. Although many of the undesirable features of corticosteroid therapy can be minimized by alternate day therapy, as in any therapeutic situation, the physician must carefully weigh the benefit-risk ratio for each patient in whom corticoid therapy is being considered. 5052” supplied in bottles of 100 and 1000 and blisters of 21 and 48. 5442” supplied in bottles of 100, 500 and 1000 and blisters of 21 and 48. 5443” supplied in bottles of 100, 500 and 1000 and blisters of 21 and 48. Dispense in a well-closed container with child-resistant closure.Store at 20° to 25°C (68° to 77°F) [See USP Controlled Room Temperature].Blisters: Protect from light and moisture. 1. Fekety R. Infections associated with corticosteroids and immunosuppressive therapy. In: Gorbach SL, Bartlett JG, Blacklow NR, eds. 2. Stuck AE, Minder CE, Frey FJ. Risk of infectious complications in patients taking glucocorticoids.